The pain we feel inside our souls or minds which are connected in complexity to millions of the unseen emotions, ideas and desires of our heart like vessels. This deep pain creates and becomes an inner conflict and a resistance to that which we are experiencing without ourselves ( on the outside). Internal pain or conflict is created when we resist those circumstances we experience outside of our soul, body and our minds. We may resist those situations or persons for many reasons; it could be confusion, anger, our unforgiveness and loss of faith. There are myriads of reasons that could create such a deep inner turmoil inside a soul that would cause it to become so conflicted it begins to lose its faith or eyes to see with. Our souls were created to have vision and feel to create and be that part of ourselves that paints our lives. Once one feels so conflicted within they find their soul’s vision has become darkened like a very dirty window it makes them feel lost or without any special reason. They long to see out but, alas! The harder they look the more conflict arises within. So what is one to do? What is the world made of? Is it just particles, molecules, atoms and energy? Are we here and then gone? We could ask a million questions and still never be satisfied with the answers or no answers that may lay on the table before us. How do we understand all this? Many of us just want to be happy! Is that too much to ask for? Unfortunately happiness does not come from the world or anything that it may give to us. That is only a perception or an emotional feeling that passes again and again. To find true happiness is only capable if we are to find peace. How does one create peace within themselves? Some may find this not such a difficult task… while others who are confined to the prison of their inner conflicts cannot reach the climax of an idea of peace left to be only more miserable and confused. We long for someone to love and to have someone love us back in such a way that we may feel whole. But in reality, this is not the truth. No one can make you whole. We are the only one who can create wholeness within each one of us. To depend on anything outside of our being to give us wholeness will only leave us disillusioned as to what wholeness and love is. Which leads me to ask…? Do we know what LOVE really is? Can we trust our own hearts to decipher this intense passion? Many times it is an emotion, an infatuation or even a comfortable arrangement of ideas. So many of us have found us ship wrecked on the rocks of love’s illusion. We are born to believe that love is someone who cares for us, hears our cry, protects us from the monsters, who feeds us when we are hungry and holds us when we want. We don’t think about will this person leave us or find someone else. We are not concerned how much we must do or not do to keep that person with us. So we are taught from the beginning that love is an unconditional feeling even though, we may learn there are rules or habits to life it does not affect love. From the time we are born we begin to upload like a computer ideas, beliefs, thoughts and opinions which many are not even our own which after many years create who we are. But the questions of truth are …. Is this that we really are? Who we were created to be? Or is this just all the cookies and pages that have been uploaded from others websites… Have we built a website of who we are that doesn’t even look like us? Who do we look like to God? It is all about perspective how we see the world and everything around us. If I took you to a very tall building and I asked you to stand outside and asked you what you could see what would you say? Then if I walked you all around the building to each side? Then if I took you into the lobby? Or what about the 22nd floor looking out the window? Or just sitting in a chair? What if I took you to the top of that building what would you see? Every answer to these questions I have presented would be different because of our perspective but they would all pertain to the same building. If you were that building where are you? What do you see? I have spent years alone trying to release myself from all the uploads of life and I have experienced every human emotion I think one could but, who is the real me? I am the one who is alone, the one who understands that I have come into this world alone and I will leave alone. This is my path, my journey and the decisions I make affect my life the most either negatively or positively. I don’t belong to anyone… I must possess my own soul and heart or I will lose the reflection that is needed to see without and within myself clearly. I guess the fight is to find peace with this feeling of aloneness which at times I perceive as loneliness when I look at the illusion. How do I find my wholeness in my oneness? So many questions…. And yet still so many answers to find. Like a spiritual explorer I set out to find new land, new places to experience seeking the answers that my soul searches for because I know they are there. Don’t you wish we all had a light switch we could just switch over to peaceful oneness whenever we don’t want to feel the negative effects of life? I believe that our lives should have a purpose and not the purpose that was created by this world but the purpose we were born with. I think it is of great importance that we recognize this purpose, this calling of our soul. Otherwise we will always feel the conflict within. Many of us have found our purpose but have not accepted it because the windows of our souls are so dirty that we have no idea what is outside. So we carry on feeling like we are conflicted with that number one question of life “Why am I here?” I have found there is two things that concern me deeply one… Is when I die if I have that moment of time to reflect on my life that I should be left asking – why I was here? Or to feel regret for the things I should have done or said. These two things I have found to be incomprehensible. Who are you? What is it that your soul reflects from this vast Universe that is alive and conducts itself accordingly, continually expanding? Every star has its purpose, every piece of sand and every bird in the sky or the beast of the field. Can we expand our minds to realize that to find oneness we must connect to everything? It would seem that the greatest truths are such contradictions. Even Jesus would say such contradictory comments an example would be when your poor your rich and when your rich your poor (obviously my version). How do we break the chains of these conflicts and fly and realize the magnificence of life as an ever moving and changing power like a mighty river of energy. Who would not want to jump into such a wonderful river? Yet it has been said by sages we are but a drop of water in a large ocean connected without an outline of ending or beginning. This spiritual metamorphosis of mind, soul and body to be born into a world small and seemingly insignificant to find ourselves alone in the midst of millions to the point we are faced with such inner conflict that we struggle to break free from this loneliness. Oh just to be a caterpillar again? Humorous! Not understanding that this internal intense struggle within to what we have been surrounded with is that which creates the metamorphosis and brings forth the wings we attain to fly and see our world from a completely different perspective and experience this new life as the same soul but not as the same creature. It is time for many of us to make this transition of spiritual metamorphosis, haven’t you felt the internal struggle the intense conflict, the aloneness, loneliness at times? Realizing that this is not all there is and willing to delete the uploads and begin with the reflection that is left on the monitor of our souls. Angels wish to have wings as beautiful as ours…. They can see us and wonder why we are so blind to what they see. Confused in such a way not to understand why someone who God gave such amazingly beautiful wings each different like our very own fingerprints and we still slither along in our world. We must allow ourselves to play again, to think like children in some ways or we will never believe in butterfly wings. We were not created just to slither along and live our lives and create our world on such common earthy erosions of illusions. Are you feeling stuck? That aloneness that I speak of is it constant? Maybe it’s your time to wake up from what is “earthly” or “let go” of that cocoon of old ideas and beliefs to break free from it’s painful comfortability and see the ever expansive picture. Surprise the angels and spread those wings and fly ~~~~~~~~~~~ reach for new places spiritually. If you have ever noticed a butterfly flits along not even noticing if the breeze is blowing or not. Just exploring one place and then flitting to another. 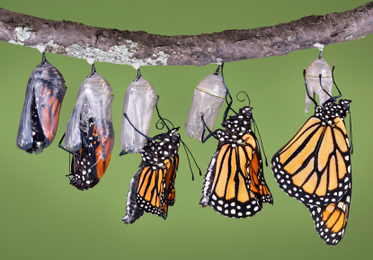 It your time to get out of the cocoon and fly! Reach outside yourself and soon you will find yourself rising above the conflicts. Fly butterfly…… fly! Posted on 12/04/2013, in Uncategorized and tagged anxiety, belief, depression, despair, faith, Faith Hopelessness, GOD, Holy Spirit, Hope, jesus, joy, peace, shamanism, wiccan. Bookmark the permalink. Leave a comment.